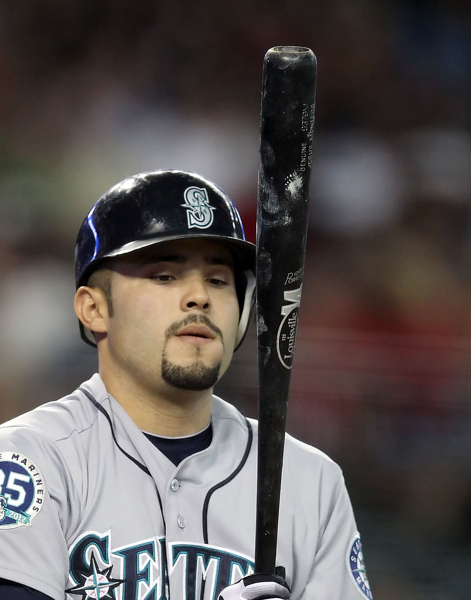 BAseball Reality Tour: Should Jesus Montero be Sent Down? In June, Jesus Montero played in 23 games - catching 8, serving as designated hitter 14 times, and drawing a pinch-hit walk on June 24. Unfortunately, his June splits are a crime scene. In June: 2 BB, 24 K's, 1 RBI, 0 SB, 1 CS. The baseball gods had to throw in that one caught-stealing to really put him down. How's this for a lack of power: 93 plate appearances, 4 extra base hits. As a sincere question, can the Mariners push back Jesus Montero's arbitration clock by sending him down to the Minors? I'm not sure if he's already locked in to his first Arbitration in 2015 and Free Agency after 2018. If there's some service time gains to be made by Seattle, it would make sense to have Montero work on hitting offspeed pitches in Triple-A, since he is struggling so badly against Major League curves and sliders. The Mariners are going nowhere fast. Coolstandings has them around 70 wins, so the cost of marginal adjustments to maybe get into the upper 70's in Wins is not worth the gain. Teams do not win over their fans any more for winning 79 games instead of 65. So, the question is what is best for Montero's development? Let's say his service clock is set, to eliminate that distraction. Where is the best place for Jesus Montero to improve? There is a valid argument that the difference between a Major League pitcher and a Triple-A pitcher is often the quality of the breaking pitches. Therefore, the best place for him to work on getting better is in a Major League lineup. How much of his struggles can, or should, be blamed on his home ballpark or his teammates? The lineup around him isn't wearing out too many bullpens. While I believe the concept of "protection" in the lineup is severely overblown, and may not even have any basis in fact, I think a quality lineup will put a hitter in a position to succeed more often than a poor lineup. Jesus Montero has not been placed in too many positions to succeed, including just about every home plate appearance this season. Small sample size warning - especially in 2011 - yet, his Career Road numbers show he's becoming an elite hitter overnight. There's no reason to panic on his predictable, long-term success. Montero still won't turn 23 until this Winter. Scouting reports praising his plate coverage, approach, and ability to hit with power to all fields, have glowed with enough superlatives to light up Yankee Stadium. Figuring out how to hit in Safeco Field may be the toughest trick. What do you think? Please add to the discussion. "Straightball, I hit it very much. Curveball, bats are afraid."